How is Battery Life Calculated? What do Those Electric Candles Actually Look Like? Every company that sells battery powered products has a claim about how long their product will run on one set of batteries. They might advertise two-hundred hours, one thousand activations, or “six months of normal use,” but there is often no explanation of how this number is derived. We at Jenesis would like to demystify the process so next time you see a claim about battery life you’ll have a better idea of what it really means. The Battery: Calculating battery life begins with the battery. Every battery operated product is designed to use one of the battery sizes everyone is so familiar with: AA, AAA, C, etc. But even within a specific size category not every battery is equal, there’s alkaline, lithium ion, nickel cadmium, and name brand verses generic. In the end the engineer must select what they believe is the battery most likely to be used in the product and a good engineer will select an easy to obtain, low cost battery rather than the absolute top of the line. The selected battery then provides the baseline for the available charge. The Load: The next step is to determine the electrical needs of the product (called the “load”). In some devices, including most Jenesis products, the electrical load is split into the circuit load (power draw when the product is not being used), and the active load (draw while in use). In some cases the active load is subdivided if the product has multiple settings for elements like brightness or duration. While there may be a lot of data to crunch, these numbers are well defined. The Time: Finally the all-important variable of time enters the equation. The engineer must consider how long the product is normally ‘on’ (called “activation”) and how many times the product is activated per day. At this point calculating battery life becomes more subjective. The product designers have no way of knowing how long or how often the product will be used once it is in the hands of the consumer, and the engineer is forced to estimate. A good engineer estimates on the high side. 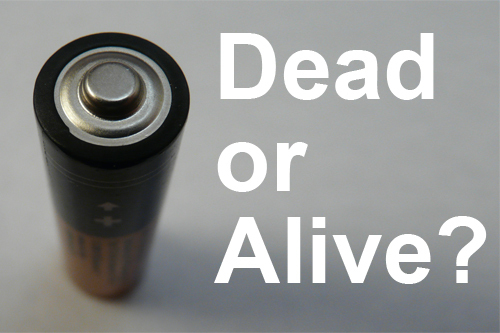 Dead: Another consideration is when to call the battery “dead.” In many products, such as our lights, there is no set point at which the battery is exhausted. The product becomes slower or dimmer or quieter until the user finally decides to change the battery. During product testing the engineer will measure the charge remaining in the battery over time, and once again a good engineer will be conservative when placing the “dead” point. Marketing: When it comes to battery powered products, battery life is clearly a key marketing element. Most consumers will select the product that boasts 200 hours of use over the one that claims 100 hours. As a result, a tug-of-war can arise between the product developers, erring on the side of caution to make sure their product fulfills the claim, and the marketers who wants to make sure the product makes it off the shelf. At Jenesis our engineering and marketing teams work closely to ensure we can make confident claims about the battery life of all of our products. The Battery: The Deck Marker Light uses three AA batteries. But what kind of AA’s? We chose name brand alkaline batteries as the most likely AA’s to be used in our product. These batteries provide 2800mAhr (milliamp hours) of capacity. For reference, a “good” alkaline AA would vary between 2700 and 3100mAhr. The Load: The Deck Marker Light has a light sensor that is on at all times with a circuit load of .02mA. When the sensor turns the Deck Marker Light on the light has an active load of .5mA. However, as the batteries are used up the current drawn by both loads starts to drop, so in the calculation we reduce the load to 75% to represent the average of the tailing off process. The Time: The Deck Marker Light’s sensor turns the light on and off automatically depending on the outdoor ambient light level. These levels change throughout the year but we assume that on average the length of darkness on a given day is 12 hours, making the activation time of the active load 12 hours per day. Dead: While the Deck Marker Light will continue to provide light past that point, we assume the batteries to be dead once they have discharged 95% of their capacity (2660mAhr). At this point the light output is 25% of its original level. We find that, on paper, the Deck Marker Light should be able to last for 13,135 hours or 1.5 years before the batteries reach the dead point. While factors like lower quality batteries and unfavorable outdoor temperatures will cause this to vary, we can be confident that our Deck Marker Light will last for a year.